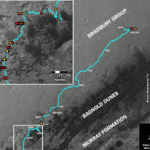 ELEMENTAL DISCOVERY Veins of calcium sulfate sampled by the Curiosity rover near the base of Mount Sharp in Gale Crater contain boron, the first time the element has been detected on Mars. Orange bars show the relative abundance of boron at sites along one vein (red markers) tested by Curiosity’s chemical-identifying laser. SAN FRANCISCO — A new element has been found in Mars’ chemical arsenal. While sampling rocks from Gale Crater, the Curiosity rover detected boron concentrations of about 10 to 100 parts per billion. 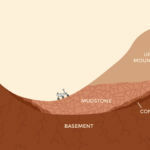 The discovery is the first find of boron on the Red Planet and hints that the Martian subsurface may have once been habitable for microbes, scientists reported December 13 at the American Geophysical Union’s fall meeting. The boron was discovered in veins of calcium sulfate. Such features on Earth indicate that nonacidic groundwater with a temperature of around zero to 60° Celsius once flowed through the area — conditions favorable to microbial life. As groundwater evaporates, boron and calcium sulfate are left behind. How this process unfolded on Mars is uncertain, the researchers said, though they expect more clues to be uncovered as Curiosity continues its trek. Boron, changing minerals offer evidence of a habitable lake and complex chemistry. 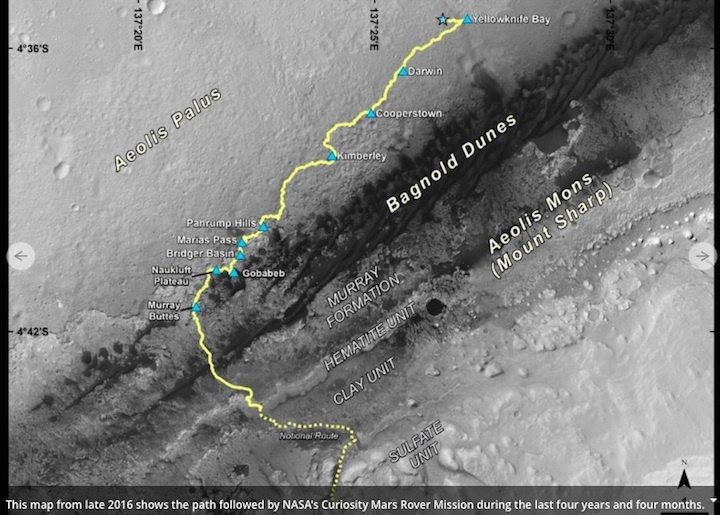 This map from late 2016 shows the path followed by NASA's Curiosity Mars Rover Mission during the last four years and four months. 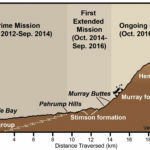 This graphic depicts aspects of the driving distance, elevation, geological units, and time intervals of NASA's Curiosity Mars rover mission, as of late 2016. 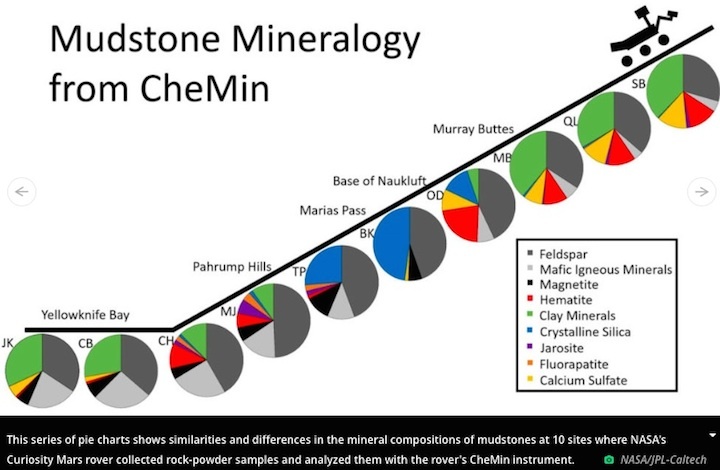 This series of pie charts shows similarities and differences in the mineral compositions of mudstones at 10 sites where NASA's Curiosity Mars rover collected rock-powder samples and analyzed them with the rover's CheMin instrument. 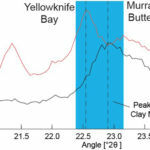 Data graphed here show a difference between clay minerals in powder drilled from mudstone outcrops at two locations in Mars' Gale Crater, Yellowknife Bay, and Murray Buttes. This diagram illustrates how the dimensions of clay minerals' crystal structure are affected by which ions are present in the composition of the mineral. 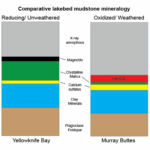 This graphic shows proportions of minerals identified in mudstone exposures at the Yellowknife Bay location, where NASA's Curiosity Mars rover first analyzed bedrock in 2013, and at the Murray Buttes area, investigated in 2016. This map shows the route driven by Curiosity (blue line) and locations where the rover detected the element boron (dots colored by an abundance of boron, according to the key at right). The highest concentration of boron measured on Mars, as of late 2016, is in this mineral vein, called "Catabola," examined with the ChemCam instrument on Aug, 25, 2016, during Sol 1441 of the mission. This examination of a calcium sulfate vein called "Diyogha" by the ChemCam instrument on Curiosity reveals boron, sodium, and chlorine. This graphic portrays two hypotheses about how the element boron ended up in calcium sulfate veins found within mudstone layers of the Murray formation on Mars' lower Mount Sharp. A present-day snapshot of the northern half of Gale Crater. North is to the left. The underlying basement is the crust of Mars that forms the crater's rim (left) and central peak (right). A snapshot in time when a lake filled the crater. As on Earth, Martian lakes were the surface expression of a much larger lake and groundwater system. Spaces between grains and in fractures were saturated with water at levels below the water table (dashed blue line). Curiosity has been on the surface of Mars for more than four years and has covered roughly 15km of the red planet. In that time, the rover has drilled into and analyzed countless rocks to learn more about the planet’s mineralogy. According to Curiosity, Mars was once a wet world with much of the chemistry required for life. 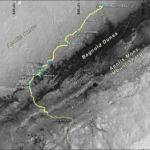 The rover has also climbed about 200 vertical meters from the bottom of Gale Crater, near Yellowknife Bay, onto the lower slopes of Mount Sharp and into the Murray Buttes feature. Amid these travels, Curiosity has revealed the changing composition of the clays and rocks. For example, scientists working with data collected by Curiosity announced on Tuesday they had recently found boron on Mars for the first time, an indicator of past habitability. Additionally, Curiosity’s rich chemical analysis of Martian rocks is helping scientists understand the nature of the large lake that partially filled Gale Crater billions of years ago. They have found evidence of ancient streams and deltas that fed the lake. Based on sediments left behind, scientists have confirmed that the lake waters were not too acidic for life to have once existed. Scientists discussed their latest findings Tuesday during a news conference at the American Geophysical Union’s Fall Meeting, in San Francisco. As Curiosity has climbed the slopes of Mount Sharp, it has found an increased amount of certain clay minerals compared to older sedimentary layers examined earlier. From this, scientists have gleaned details about Mars’ climate billions of years ago and how it may have changed during the critical few hundreds of millions of years when water was abundant on the planet’s surface. 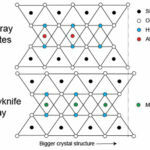 One of the ways scientists have reached this conclusion is through X-ray diffraction, which can identify minerals from their crystalline structure. At the lower elevations, Curiosity found more magnesium and reduced iron, whereas, higher up, the minerals include more aluminum and oxidized iron. These differences hint at the complex water chemistry of Mars in the past, said Thomas Bristow, a staff scientist at NASA’s Ames Research Center. Further complicating these studies of ancient Martian chemistry is that minerals can form in place or be transported by water. Even with four years of data from present-day Mars, building a model of how water moved around on Mars three billion years ago is still a challenge. The scientists now believe that rivers brought sediment into Gale Crater about 3.5 billion years ago. 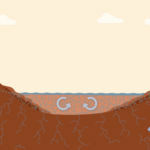 Those rivers deposited pebbles higher up and sand in the center of the basin, where there was a standing body of water. As these sediments built up at the base of the crater, the lake level rose. From samples taken by Curiosity when it was in Yellowknife Bay, scientists were able to study the sandstone and mudstone that were buried by dust after the lake dried up. 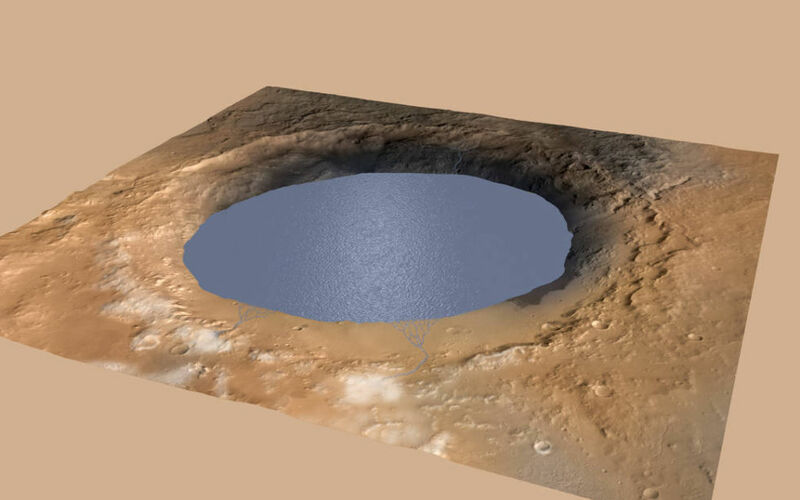 Enlarge / A simulated view of Gale Crater Lake, measuring about 150km across, on Mars about 3 billion years ago. As they study these Martian clays, scientists and geologists must also account for the movement of a larger groundwater system, which would have remained moist long after the surface lake dissolved when the Martian atmosphere disappeared and the planet cooled. 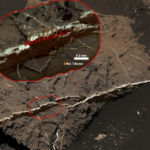 “Any microbes could have remained happy in those cracks for a long time,” said Curiosity scientist John Grotzinger, of the California Institute of Technology. The finding of boron, for the first time on Mars, tantalized scientists as well. 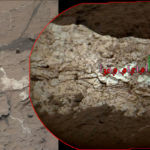 Curiosity’s ChemCam instrument has recently found the element in mineral veins. 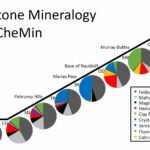 Boron makes up about one tenth of one percent of the rock’s composition. Scientists have several ideas for why they’re finding the rare, highly water-soluble element on Mars. 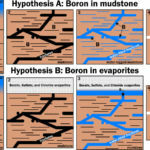 Boron indicates the presence of complex chemical processes playing out long ago within Mars’ rivers and lakes. These are not smoking guns for life—Curiosity has not found microbes or fossils—but more complex chemistry increases the odds that life arose on Mars. Additionally, some scientists think a certain form of boron is needed as part of a chemical reaction to create RNA. Sadly, Curiosity cannot discern differences in boron types. With their latest observations on Mars, scientists have pushed the limits of Curiosity’s chemistry kit. Another rover similar in size and design to Curiosity, Mars 2020, should launch in July, 2020. It will have an ultraviolet Raman spectrometer and the capability to determine whether the boron on Mars is the mineral form thought to be part of the RNA reaction. Mars 2020 will also be able to detect organic compounds. So while Curiosity hasn’t found life, it has certainly succeeded in raising the curiosity of astrobiologists and left them wanting more data from the red planet.